The standard variety for many years. Summer Crookneck has been improved to have smoother, less warted skin and more compact bush type plant. This variety is very popular, easy to grow and fast maturing. Many gardeners feel that this variety is more flavorful than the straight neck types. Delicious baked, steamed fried, boiled or served raw. Early Summer Crookneck freezes well. Pick fruits before they mature and the plant will continue to produce more vitamin rich fruit until frost. Fruits are best when harvested young, about 5-6 inches long. 250 Seeds/oz. Plant 1/2oz per 100ft row. 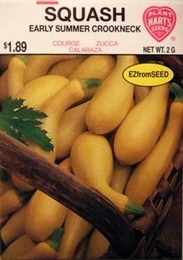 4lbs of Squash seed needed per acre. Average Squash yield per acre -494 bushels.